A Hong Kong-set post-war romantic drama, Love Is A Many-Splendored Thing has a few good ideas about multi-racial relationships, but also gets bogged down in a generally unimaginative script. In Hong Kong of 1949, Dr. Han Suyin (Jennifer Jones) is a prominent Eurasian doctor working at a busy hospital. A widow, Suyin has decided not to get involved in any further romantic relationships. 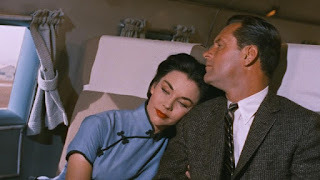 But then she meets American foreign correspondent Mark Elliott (William Holden), who openly admits to being married but estranged from his Singapore-based wife. Mark is persistent in his pursuit of Suyin, and gradually she grows attached to him. After several dates they become a couple, despite the wagging tongues of Hong Kong's social elites. Suyin questions whether a Eurasian woman can ever be accepted as the partner of an American man, and after an argument abruptly travels to China to reconnect with her family elders. Mark does not give up and proposes marriage, but complications await in the form of securing a divorce from his wife, while the eruption of the Korean War adds another obstacle to happiness. Directed by Henry King as an adaptation of the autobiographical novel by Han Suyin, Love Is A Many-Splendored Thing is traditional romance with all the expected impediments. Suyin and Mark have different ethnicities and backgrounds, he is married, she is widowed and happy to remain unattached, and her traditional family is uncomfortable with a modern, cosmopolitan union. The more original aspects of the film revolve around Suyin forging ahead with establishing a strong identity unencumbered by her mixed heritage, and resolutely ignoring those who wish to believe that a Eurasian woman cannot be a respected doctor or the lover of an American man. The Hong Kong backdrop, with many scenes filmed on location, and the rumblings of the communist revolution in nearby China, also add some interest. But otherwise, the film trundles along fairly slowly, the romance taking its time to ignite and then simmering quietly. The script singularly focuses on Suyin and Mark, and they are front and centre and almost alone in every scene, creating a rather claustrophobic environment and a lack of relief from the travails of two people. There are very few supporting characters, with Isobel Elsom as the insufferable local society gossip Adeline Palmer-Jones the most prominent. William Holden and Jennifer Jones apparently could not stand each other while filming, but on the screen they generate sufficient chemistry to make for believable lovers. With so little else going on the two stars had to be good to make the movie tolerable, and they do make the best of their characters. Less helpful is a suffocatingly overcooked music score that explodes into unnecessary flourishes at every opportunity, and deploys the strings of the title song seemingly every 90 seconds. Love Is A Many-Splendored Thing is passionate enough but also suffers from the creative clumsiness evident in its title.